Facebook revealed this week that now it delivers 1 billion video views per day and announced that it will now begin showing everyone view counts on videos posted by Pages and public figures. The feature will be rolled out to users this week itself and will help users discover popular videos, as per the company declarations. According to, Facebook, video views on its site grew by more than 50 percent between May and July this year. The social media giant is also testing a new feature on mobile that serves up suggested videos when a user has finished viewing video content showing videos that are related to the one that’s played. 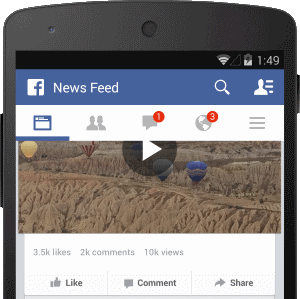 The company made one more announcement that more auto-playing videos will now appear in your News Feed. This move is certainly going to convince advertisers shifting TV ad spend to digital to look to Facebook, which recently bought video adtech company LiveRail for between $400 million and $500 million in July.